After finally getting his title shot on the back of seven-fight win streak, Demian Maia was given just four weeks notice to prepare for Tyron Woodley at UFC 214. Woodley got back to the gym shortly after his successful rematch against Stephen Thompson in early March. Yet, the champion does not feel any sympathy for his next opponent, Maia, who only had his title date confirmed at the end of June after fighting Jorge Masvidal in May. “He’s had seven fights to get ready for me. He knew where I was. He knew I was at the top. I’m not taking him by surprise,” Woodley told Ariel Helwani on the latest episode of The MMA Hour. “If we sprung a fight night on you, guess what, you’re going to have to be ready to cover a fight on two days notice. It’s your job. Woodley also suggested that fighters could sometimes fight better when they take fights on short notice. 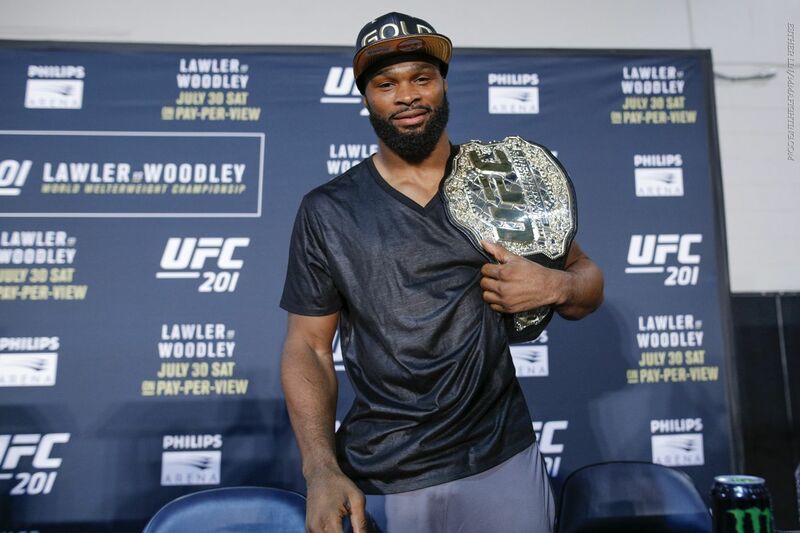 “When I was offered a fight with Robbie Lawler last year, when something happened with Jon Jones versus Daniel Cormier 2, on 10 days notice I said yes,” said Woodley. “When Michael Bisping got the opportunity he said yes. When Nate Diaz got the opportunity he said yes. This is what we do. “Granted, you’re not going to be 100 percent in fighting shape every day of the week, it’s stupid and it’s not fun for your body, but he has known about me. He has watched film on me. He has watched me compete. He has watched film on me as a competitor the same way I looked at him. Woodley went on to list the advantages of taking fights on short notice. “I didn’t have to overthink it. I didn’t have to over analyze it. I didn’t over train and I didn’t miscalculate where I was going to be for the fight,” he said. “Four weeks? Yeah, sometimes I’m better when I cram. When I know I have that date that’s coming up sooner I can push myself a little bit more.